William MacLurg was the son of Rev Alexander MacLurg and Nannie Nicol MacLurg. William was born in Ardstraw, County Tyrone on 12th September 1897. He was a boarder at the Royal School Dungannon when he studied in 1910 and 1911. The family moved to Toronto in Canada in 1913. 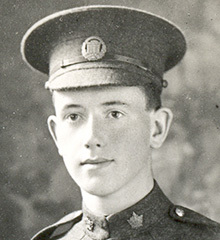 William enlisted in Toronto on 29th September 1915. He was working as a clerk. Lance Corporal William MacLurg was serving with the Princess Patricia's Canadian Light Infantry when he was killed in action the second battle of the Somme on 15th September 1916.